The game between Rocket and Milwaukee was a battle of MVP candidates, but neither Giannis Antetokounmpo nor James Harden stole the show in the Bucks' 108-94 victory. For that matter, no single player did. Rather it was the Bucks' unique defense that will have everyone talking, as it held James Harden to just 23 points — 13 below his season average — on 9-of-26 shooting. Using the same strategy they employed in the first matchup with the Rockets earlier this season, the Bucks completely overplayed Harden's left hand, giving him a clear path to lane — so long as he drove right. It was the type of scheme you might expect to see against a dominant middle school player, or even out on the playground, but not in an NBA contest. At times it was almost comical, as Bucks defenders ended up to the side, and even behind Harden in an effort to prevent him from going to his dominant left hand. Additionally, due in large part because they sat on his left hand and prevented him from getting off his patented step-back jumper, Harden went just 1-of-9 on 3-pointers. He averages over 13 3-point attempts per night, and the one make is the fewest he's had since back on Feb. 27. It didn't hurt that the Bucks avoided fouling Harden as well. Being able to get to the line for easy points generally allows Harden to put up big scoring nights even when his shot isn't working. But this game, he took just five free throws, well below his season average of 11. Harden still made some shots, because he's one of the best offensive players the league has ever seen, but they were tough looks, and not in the areas he prefers. Notice how many shots he took inside the paint, but not at the rim. For the season, he's taken just 68 such attempts, just about one per game. On Tuesday night, he took seven. Both Harden and Rockets head coach Mike D'Antoni downplayed the impact of the Bucks' strategy on Harden's poor game. "That's what they tried to do to him in Houston, but I think he had 41 points and a triple-double," D'Antoni said. " The man himself was a bit more direct. Asked what kind of impact the Bucks' defense had on him, Harden offered: "None, none. I still got my shots up, I was still aggressive. I still did what I was supposed to do." 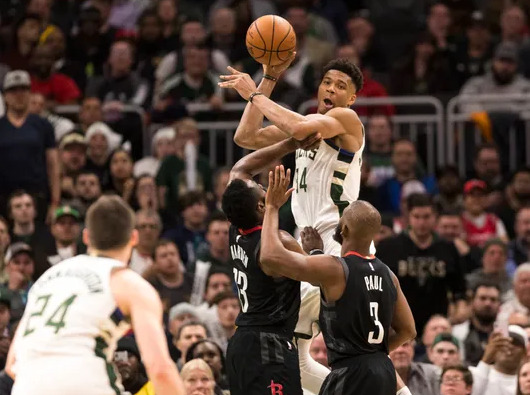 Its hardly to say that the Buck’s strategy against the Rocket really work just according to the last two game they played with each other,but this time at least, the Bucks' defensive game plan succeeded.